Fergus Campbell recently took the top spot at Imtech Marine USA. He discusses the path forward, particularly the desire to expand the ubiquitous Radio Holland brand. How did you come to a career in the maritime industry? There were a number of factors that led me to this career. Growing up in a small seaport town along the banks of the River Clyde, I remember from a young age being captivated by the variety of ships sailing by and wondering what it would be like to work on them. This idea of going to sea and seeing the world stayed with me throughout my teenage years and (I ended up going) to Glasgow College of Nautical Studies (GCNS) to study electrical and electronics. This was at a time when the British Merchant Navy was in decline and job prospects for Radio officers at sea were pretty bleak. However in my final year, while studying Radar Maintenance, a new classmate joined our class who was working for Denholm’s in the North Sea on a diving support vessel. I walked into Denholm’s office on speculation and six weeks later I was joining the same vessel as his back-to-back relief. This was part of a pilot program Denholm’s was running, training Radio Officers to also take care of the engine room, electrical and automation systems. This program led to the start of Electro-technical Officers (ETO’s) which is a common function on most vessels these days. After spending five years at sea on various assignments and vessels, I came ashore and found myself working as a technician supporting automation systems on vessels. Over the course of seven years as a technician I found myself involved in retrofitting systems on many of the major cruise ships and spent a lot of time in the U.S. during their drydock periods. Then in 1998 I was asked to open a support office for the cruise ships in the Miami area. We established our office on October that year by renting office space from Radio Holland Miami and the rest is history. Imtech has been a driver of consolidation in recent years. For MR readers not intimately familiar with the company and its offering, can you describe it in one or two sentences? Imtech Marine is a technically innovative global company. We offer a full range of services, from traditional Navigation/Communication systems, high capacity Satellite Connectivity solutions to HVAC, Electrical power generation/distribution, Automation and Propulsion to name a few. As a system integrator and solution provider we now can cover the entire vessel from Bridge to Engine Room. Coming into the position, what are your near and longer term goals, and how do you plan to achieve them? In the near term we aim to have a larger presence and take new approaches to the market, focusing on new requirements of our customers but also building on our remote monitoring and maintenance capabilities. Long term we are preparing our organization for growth and focus on being a solutions provider and system integrator to our customers by introducing new technology and services that can impact their business in a positive way. You have had a diverse career including 10 years with Radio Holland USA. What will you take away from your past assignment that will be of value to Imtech and its customers? Being with the company before has advantages from an inside perspective. Being on the receiving end of the services we provide gives you a totally different perspective, both are valuable from an experience point of view and will help us to improve and provide good quality customer service. How is Imtech today … and its resurgent Radio Holland USA brand … the same and different from the Radio Holland that you worked for five years ago? It’s the same from the perspective that our core business revolves around traditional Bridge Navigation/communication equipment and service and maintenance around the globe. However, we are adding new solutions, innovation (such as remote monitoring, ICT), new technologies we offer and maintain, such as electrical, automation, and new maintenance formats. 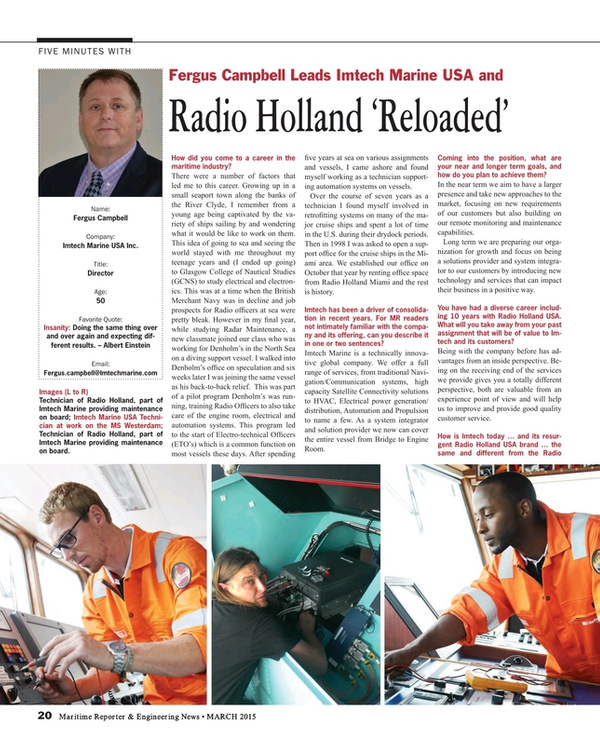 Times have changed, requirements of the market changes all the time, so it is Radio Holland ‘reloaded,’ focused on our customers’ requirements and helping them achieve efficient operations, keeping their fleet operational. That last one remained the same! As Director of the Imtech Marine USA, you now lead a considerable team of system integrators for the marine industries. Where do you think you and Imtech will have the most impact in the coming years in this market? For a number of years now there has been a trend in the shipyards to use System Integrators for their new build projects. But also refit projects, like the project we started refitting three bridges of Holland America Line cruise ships. At what point does the shipyard’s responsibility and that of the OEM become yours – as the systems integrator? How will it all work when your goal of becoming “a supplier independent top three player in the global marine market.” What does that phrase really mean? As a system integrator, our responsibility lies in the engineering, project management, scheduling, installation and commissioning of the OEM equipment. Clearly we have to follow closely the construction schedule of the vessel which is the ultimate responsibility of the shipyard. As for the OEM, we have to ensure that the installation of the equipment is to their exact standards to ensure their warranty is validated and will be honored to the client. As for what the phrase supplier independent means, it speaks for itself: we believe our core competences in the key disciplines are applicable, regardless of who the equipment manufacturer is. The world, as always, is in various economic stages, either emerging from the economic meltdown of 2008/09 or digesting the dramatic plunge in oil prices second half of 2014. As you look over your area of responsibility, by market niche, by geographic region (or both), where do you see the most promise for better business today? We operate in most key markets to minimize the impact of any downturn in one. This also allows us to focus on market specific trends. Our business is also driven by new regulatory changes and the retrofitting of old obsolete equipment with more modern technology. Recently we have been successful in the retrofitting of Bridge Navigation equipment in the cruise sector for example. Efficient and effective maintenance is also a driver for better business of the ship owners. Preventive maintenance will save money and lower operational costs, keeping the fleets at sea without interruptions. ‘Connectivity’ is another driver. Connectivity is more than providing communication and crew welfare. We see a key benefit in using VSAT as an enabler to monitor systems remotely on board a ship, which increases availability and lowers the cost of operations.